In the fall of 1971, I was just out of college and beginning my second education as a photographer. For one year, I traveled throughout North Carolina with my Nikon camera and Tri-X film. I had an assignment from the newly formed public policy program at Duke University to photograph substandard housing and living conditions in the state. This was an opportunity for a young, Atlanta-born southerner to become aware of something about the South beyond the suburbs by looking in depth at one southern state, by meeting, photographing, and getting to know people in their homes and dwellings, and at work in the fields. Every photographer hopes to create a distinctive body of work, no matter at what stage in a career, to discover a way of seeing and photographing that is uniquely his or her own. But none of us can avoid the pictures we carry with us in our minds from photographers who have come before. As I wandered around North Carolina, I was fortunate to have good influences. So I did. I took five or six shots that went nowhere. I had been counting on the family to stay close together there on the porch, but after a few minutes, the other children wandered inside and even the dogs abandoned the scene. At the time, I didn’t have much experience as a photographer, but I knew when the pictures weren’t going to get any better. I thanked the young woman and said goodbye. As she turned, still holding her son, to follow her other kids back inside, I lifted my camera and made one more exposure. This one is like a dream. It’s a southern dream any of us could have. It is the bare bones of a story we can only imagine. 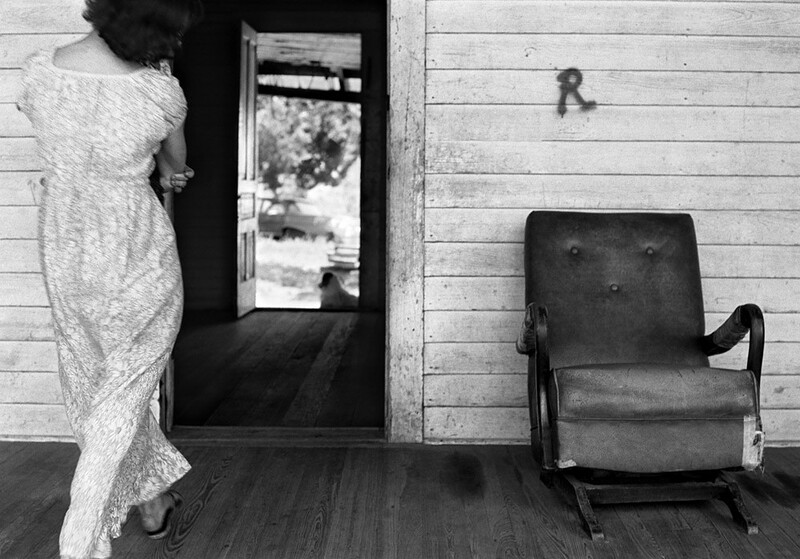 A woman of indeterminate age strides towards an open door. She walks with purpose and grace – left foot forward and poised above the floor, her child hidden from view but there in her tight embrace. She is our mother, perhaps the Madonna protecting the child that will one day save us all. But for now she is walking past a large spray-painted letter, a black cursive R. R for Reap, Rejoice, or Repent? Below that R, an old brown chair radiates so much personality its three buttons form the eyes and nose of a face, with a dark smiling mouth in shadow below. A benevolent God in disguise? Perhaps that was R for Rapture? She is walking from light into near darkness. Three strides beyond is second door where we see framed dog, a junked car, and part of a tree shading a dazzlingly bright yard. From light to darkness and back into the light.